Flipper EOS (end of stroke) switch used on some late-model Gottlieb/Premier games. 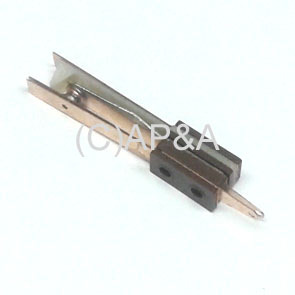 Used in switch/bracket assembly #s 26438 and 26439. This replacement switch features 2 solder lugs. Will replace originals having 4 solder lugs- simply re-route and solder the switch capacitor wires to the 2 lugs, which are shared with the coil wires. Remove bottom bakelite spacer on this switch stack to secure to mounting plate (refer to original switch assembly for reference).